Simulation-based learning in surgery is a learning model where an environment similar to real life surgical situation is created for the trainee to learn various surgical skills. It can be used to train a new operator as well to assess his skills. This methodology helps in repetitive practice of surgical skills on nonliving things so that the operator can be near-perfect when operating on a live patient. Various models are available for learning different dermatosurgery skills. Methods of teaching and mastering surgical skills are changing in today's competitive environment. Previously, there was hardly any formal training in basic surgical skills and most medical students and residents had their first lessons by observing and then practicing their skills on the patients, using the formula, see one, do one, teach one. But this is no longer easy, as clinical pressures nowadays require the highest degree of efficiency and leave no room for shoddy work or errors in the operation theatre. Besides, lack of valuable operating time leaves very little time for the surgeon to teach students inside the operating environment. In addition, surgical skills cannot be mastered by simple observation. Additionally, cadaver training is not easily available. To overcome these difficulties, simulation-based learning becomes a viable method. Besides, it additionally provides an opportunity to teach and then assess medical students objectively and in addition, gives the students a chance to practice extensively and gain confidence before they enter the operating room and operate on live patients. In addition, it is a useful method for older practitioners wanting to upgrade their surgical skills. Various teaching tools can be used for surgical training. Suturing techniques are the basic surgical skills required by all residents practicing surgery. The rapid expansion and demand for dermatosurgery has compelled postgraduate students to learn surgical skills as well as older dermatologists to upgrade themselves. Mastering suturing skills is the cornerstone of surgical procedures. The traditional teaching methods include didactic lectures, clinical discussions, and audiovisual presentations. However, these are one-way programs and are not very useful for the development of technical surgical skills. The "mentored" approach of learning surgical skills is another conventional method, where the postgraduate student observes the procedure being done by the mentor, gradually learns the procedure, then performs under supervision, and soon performs it independently. The main drawback with this approach is that it may not always be possible for the mentor to teach when the patient load is high or when there are too many students observing the procedure. In addition, learning surgical skills on a live person can have medical, legal, and ethical issues. The use of simulation has shifted the learning of basic surgical skills from the operation theatre to the laboratory to practice and hone surgical skills. There are various types of simulation techniques , [Table 1]. Newer methodologies to teach surgical skills and assess students objectively have been developing as well. These include virtual reality, robotics, telemedicine, computer games,  artificial skin, and wound closure pads [Figure 1]. Their success depends on how close they are to reality in terms of the texture and handling. There are various shapes and sizes that are available. 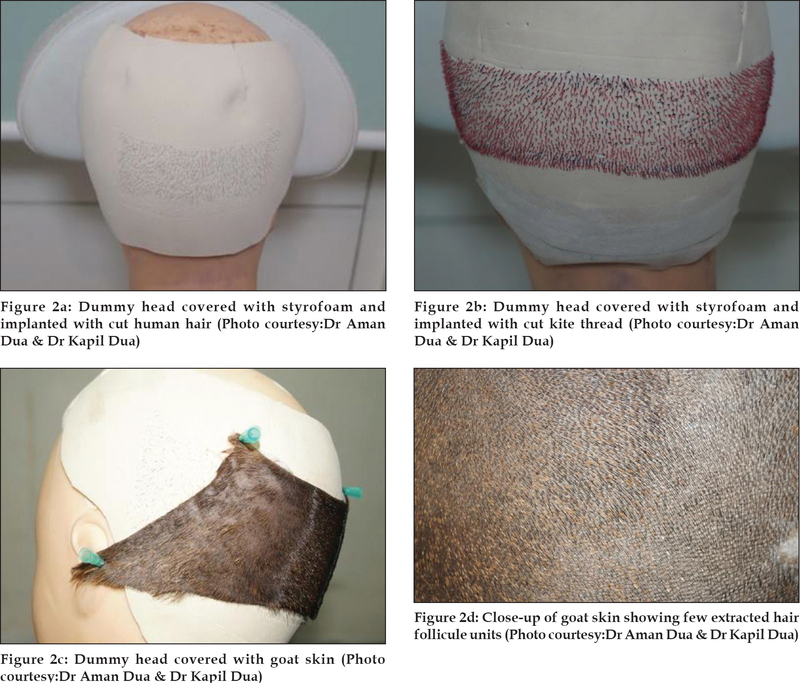 Similarly simulation surgery can be used for learning hair transplantation where artificial hair may be transplanted onto pig skin.Other hair traansplant simulations include fixing goat skin on a dummy head or fixing black kite thread or discarded human hair on a styroform base fixed to a dummy head [Figure 2]a-d and [Figure 3] In vitiligo surgery, pig skin or cow skin may be used as both donor and recipient site for learning mini punch grafting and split skin thickness grafting. 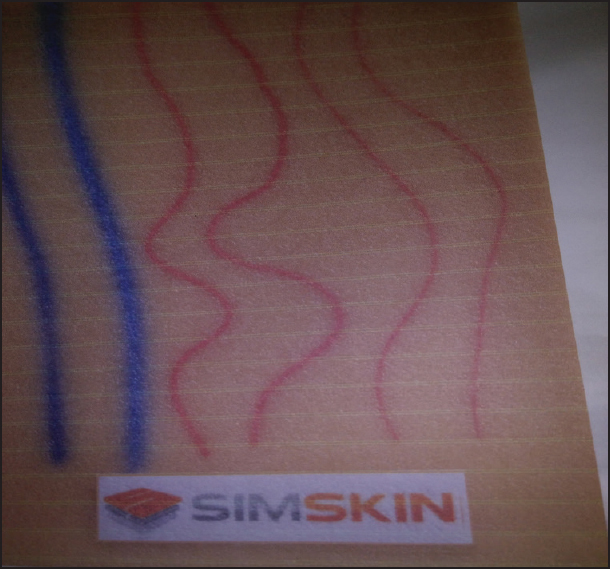 Sclerotherapy pads containing several vessels of various diameters ranging from 0.2-3 mm are also available for training for sclerotherapy (SimSkin Sclero pad, Chicago, USA, www.Simskin.com) [Figure 4]. The future of simulation-based learning in dermatological haptic virtual reality surgeries are virtual reality models. These will create a situation similar to that in the operation theatre. Haptic systems or haptics are a part of advanced virtual reality systems that interacts with the user's sense of touch. 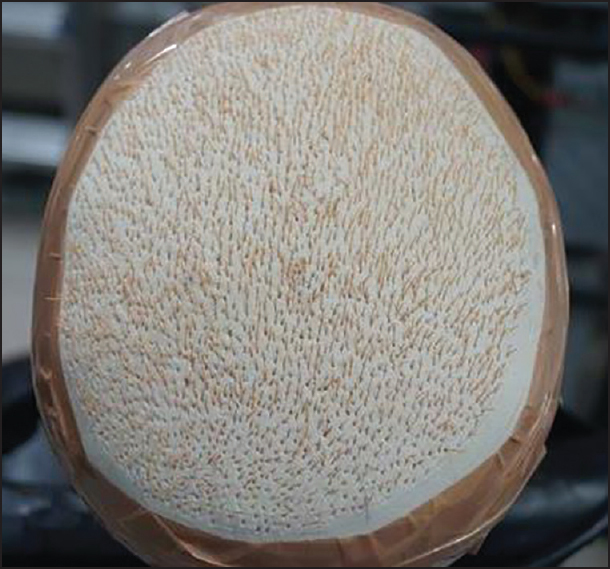 3D printing has been used in urology where organs (the kidney, renal pelvis, and ureter) were created with a 3D modeling software, printed with a Spectrum Z510 3D printer (Z Corporation, 3D Systems, USA), and cast with Dragon Skin 30 silicone rubber (Smooth-On, Inc. Macungie PA 18062, USA). The model was secured in a laparoscopy box trainer for use. 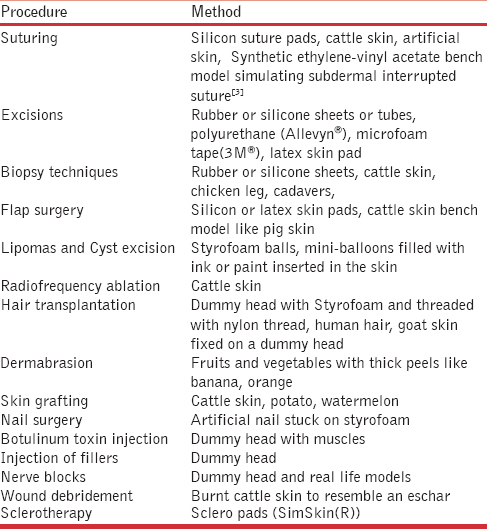 Similar models can be developed for dermatological procedures. Simulation-based training is becoming an increasingly popular tool to teach suturing skills. It helps medical students, surgical residents in various specialties including dermatology, and additionally older practitioners to learn and master surgical techniques. Simulation enables the trainee to avoid the early error-prone and difficult part of the surgical training curve and in addition, to gain confidence before entering the surgical operating environment. Torkington J, Smith SG, Rees BI, Darzi A. The role of simulation in surgical training. Annals of The Royal College of Surgeons of England. 2000;82:88-94. Krummel TM. Surgical simulation and virtual reality: The coming revolution. Ann Surg 1998;228:635-7. Sarker SK1, Patel B. Simulation and surgical training. Int J Clin Pract. 2007;61:2120-5. Denadai R, Toledo AP, Martinhão Souto LR. Basic plastic surgery skills training program on inanimate bench models during medical graduation. Plast Surg Int 2012;2012:651863. Evans CH, Schenarts KD. Evolving educational techniques in surgical training. Surg Clin North Am 2016; 96:71-88. Reznick RK, MacRae H. Teaching surgical skills--changes in the wind. N Engl J Med 2006;355:2664-9. Denadai R, Oshiiwa M, Saad-Hossne R. Teaching elliptical excision skills to novice medical students: A randomized controlled study comparing low- and high-fidelity bench models. Indian J Dermatol 2014;59:169-75. Denadai R, Oshiiwa M, Saad-Hossne R. Does bench model fidelity interfere in the acquisition of suture skills by novice medical students? Rev Assoc Med Bras 2012;58:600-6. Grierson L, Melnyk M, Jowlett N, Backstein D, Dubrowski A. Bench model surgical skill training improves novice ability to multitask: A randomized controlled study. Stud Health Technol Inform 2011;163:192-8. Denadai R, Souto LR. Organic bench model to complement the teaching and learning on basic surgical skills. Acta Cir Bras 2012;27:88-94. Rothenberger J, Seyed Jafari SM, Schnabel KP, Tschumi C, Angermeier S, Shafighi M. Evaluation of medical students› attitudes and performance of basic surgery skills in training program using fresh human skin, excised during body contouring surgeries. J Surg Educ 2015;72:868-74. Calì C, Baghabra J, Boges DJ, Holst GR, Kreshuk A, Hamprecht FA, et al. Three-dimensional immersive virtual reality for studying cellular compartments in 3D models from EM preparations of neural tissues. J Comp Neurol 2016;524:Spc1. Oestergaard J, Bjerrum F, Maagaard M, Winkel P, Larsen CR, Ringsted C, et al. Instructor feedback versus no instructor feedback on performance in a laparoscopic virtual reality simulator: A randomized educational trial. BMC Med Educ 2012;12:7. Denadai R, Saad-Hossne R, Todelo AP, Kirylko L, Souto LR. Low-fidelity bench models for basic surgical skills training during undergraduate medical education. Rev Col Bras Cir 2014;41:137-45. Cheung CL, Looi T, Lendvay TS, Drake JM, Farhat WA. Use of 3-dimensional printing technology and silicone modeling in surgical simulation: Development and face validation in pediatric laparoscopic pyeloplasty. J Surg Educ 2014;71:762-7. Mitchell NM1, Cutting CB, King TW, Oliker A, Sifakis ED. A Real-Time Local Flaps Surgical Simulator Based on Advances in Computational Algorithms for Finite Element Models. Plast Reconstr Surg. 2016;137:445e-52e. Shewaga R, Knox A, Ng G, Kapralos B, Dubrowski A. Z-DOC: a serious game for Z-plasty procedure training. 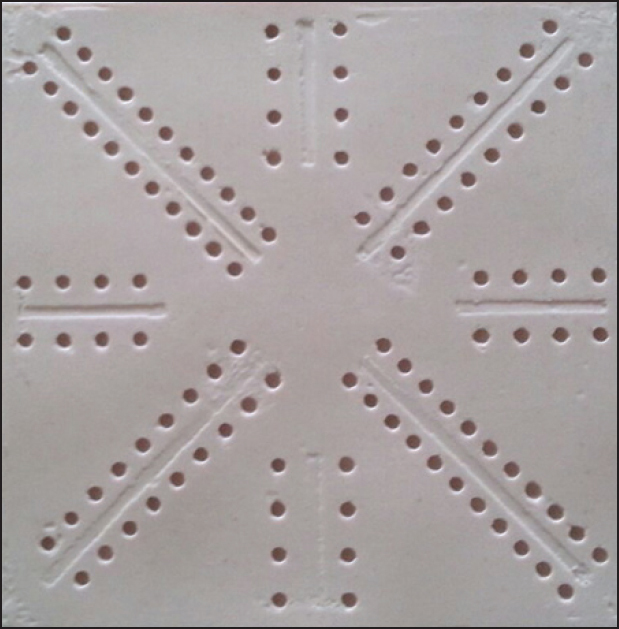 Stud Health Technol Inform. 2013;184:404-6.